You absolutely love the idea of a tiny house. Picturing your life in seasons from the viewpoint of your tiny home is nothing short of a fantasy to you. The problem is, you may not be sure you’ll have all the appropriate things you need to be comfortable in your little home (like heat), and winter is fast approaching. Fear not! 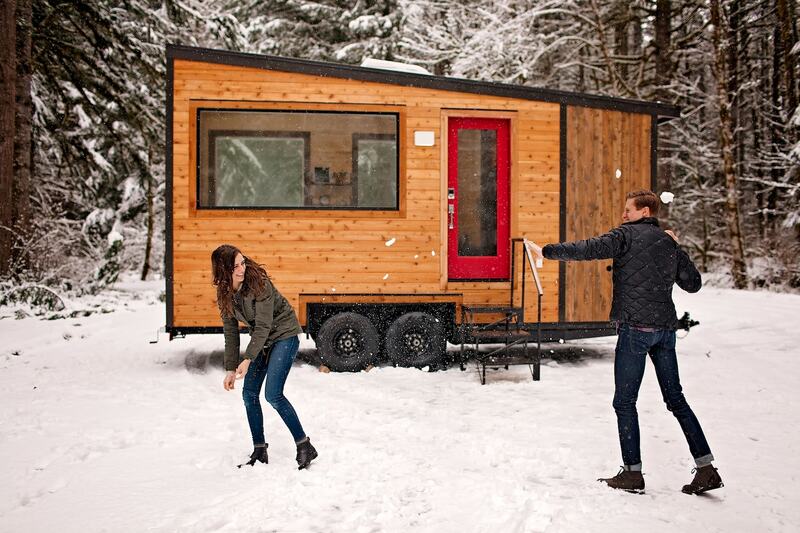 Heating a tiny house is actually a lot easier than you think. Read on to learn a few things that you can do to keep yourself nice and toasty - and keep the bills down, too. There are many differing opinions on wood stoves. Wherever you land personally, it's really cool that the classic stove can be combined with the modern home. The wood stove would act like any other stove in any traditional home, except that it's smaller. Having one installed can be just a little pricey (you are working with actual fire, after all! ), so the price reflects a proper and safe installation. But once everything is set, you can warm up your entire mini home with natural heat. Don’t forget to consider your plan for firewood, though. Maybe add a storage area outside for it? If you already have a grid-tied power source (or if you're not afraid to invest in one) then getting a mini split is the best way for you to go. They're very small, very discreet and can be mounted on the wall so you won't have to worry about tripping over it. Mini splits are also very efficient with the ability to be ran off solar power with the right setup and they’re reliable and easy to clean when not in use. In short, they are a solid choice for any homeowner. This has been a growing trend as of late. You can legitimately have all the heating options of a traditional home, only smaller - and that includes propane heaters. Tiny propane heaters are a great option for those who don't have the setup needed for a mini split, or the strength or land to chop wood. Tiny propane heaters come with a built-in ventilation system as well as a built-in blower to help circulate the heat, so you really don't have much to do on your end except make sure it has fuel to burn. It's also very safe, simple to use, and extremely economical, so it's definitely an option you should consider. Investing in a tiny home doesn’t mean you need to sacrifice the essential comforts of living in a standard-sized home. At Tiny Heirloom, we make sure to give our clients only the best materials and housing that we have at a cost that suits their needs. Take a look at our selection of custom homes, Signature Series, DIY options, and so much more.